What a wonderful day in Tucson! We had beautiful weather and a stream of lovely princes and princesses stopping by to discuss ‘The Gilding’ and ‘The Outsider’. We even had some princesses try on the fairy tiara that I was honored to bring to the Festival. Such regal heads! Digital Day is Friday, December 29th on Amazon. 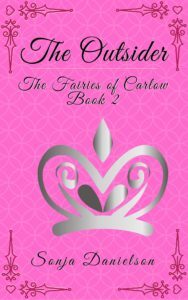 As a gift to you, my dear readers, I have reduced the price on the eBook for The Fairies of Carlow, Book 1, The Gilding. Continue reading Digital Day Is Coming! Posted on December 27, 2017 December 27, 2017 Categories The GildingLeave a comment on Digital Day Is Coming! When I am writing my latest manuscript, I use a 5×7 journal to keep track of all the details. It is invaluable. Posted on November 23, 2017 November 23, 2017 Categories MusingsLeave a comment on Happy Thanksgiving! The Fairies of Carlow: The Outsider will be available in hardcopy soon! Princess Morgen’s story will be available in hard copy within the next week. She much prefers reading an ebook, but understands there are those who like the feel of paper and the weight of the book in their hands. She would love to meet you in either format! Posted on November 6, 2017 November 5, 2017 Categories The OutsiderLeave a comment on The Fairies of Carlow: The Outsider will be available in hardcopy soon! Do you want a copy of the e-book for The Outsider? Book 2 of the Fairies of Carlow series, The Outsider, is now available exclusively on Amazon. I hope you will leave a review or send me an e-mail to let me know what you think of Princess Morgen’s story! Posted on November 5, 2017 November 5, 2017 Categories The OutsiderLeave a comment on Do you want a copy of the e-book for The Outsider? Can you figure out the color of Princess Morgen’s rose?